note: for the CAS-ual Fridays Challenge, please click here or scroll down. This week for my sketch-based card, I looked through my dies to find something small to hang for the banner elements. 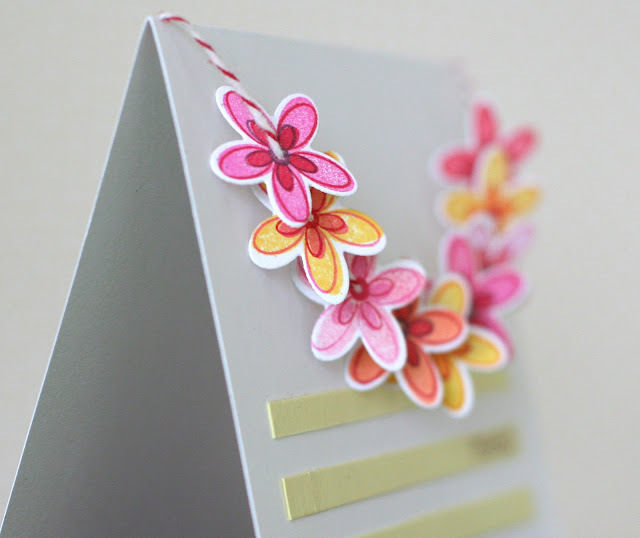 This small flower and die set hadn't seen use yet, so I ended up making a Hawaiian lei out of it. 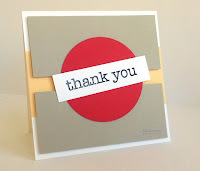 The striped background is toned down from the sketch to just three lines, with the Hawaiian sentiment of "thank you" embossed in bronze on the middle line. 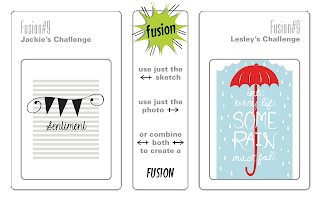 Please stop by the Fusion blog to check out the other sketch, photo and fusion inspiration from my design teammates, and to link up your own interpretation! This week we've got a theme of congratulations at the CAS-ual Fridays Challenge. And our sponsor is CAS-ual Fridays Stamps, so there's a nice prize lined up for the winner! This one uses the bombs and sentiment from the CAS-ual Fridays Ka-Boom set. I was working off a banner card sketch, and got it in my head that it would be funny to put bombs on the banners. No flowers, bunnies, or other frilly things. Just bombs, that are exploding. In a congratulatory way! 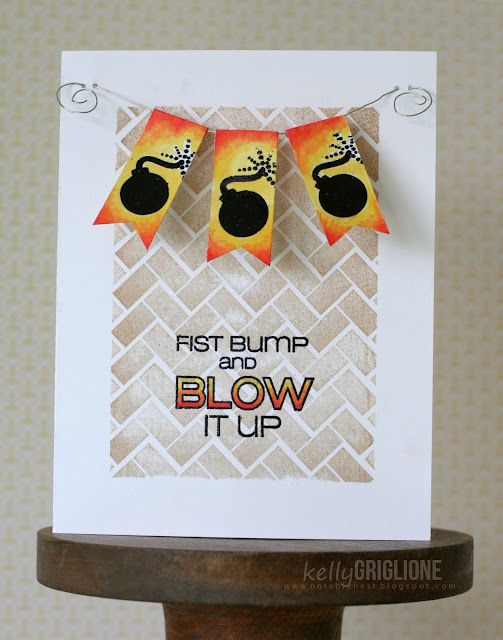 Luckily the word "blow" is outlined, so I can fill it with the same color treatment as the banners to tie it all in. The background is one I hadn't inked up yet from Brickworks. LOVE how it turned out .. fills the space, looks interesting, yet not distracting. I used washi tape on the edges as a mask. The banners happened to point out nicely, yet are flat for mailing. No adhesive on the wire, it's just threaded through two holes and then wound in a spiral to secure. Sure hope you'll stop by CAS-ual Fridays to check out the other wonderful designers, and to link up your own fab creations! ETA: I'm also linking this up to the FUSION challenge since I used the sketch as inspiration, but couldn't post it at the time. HAPPY BIRTHDAY ARDYTH!!! You ROCK! 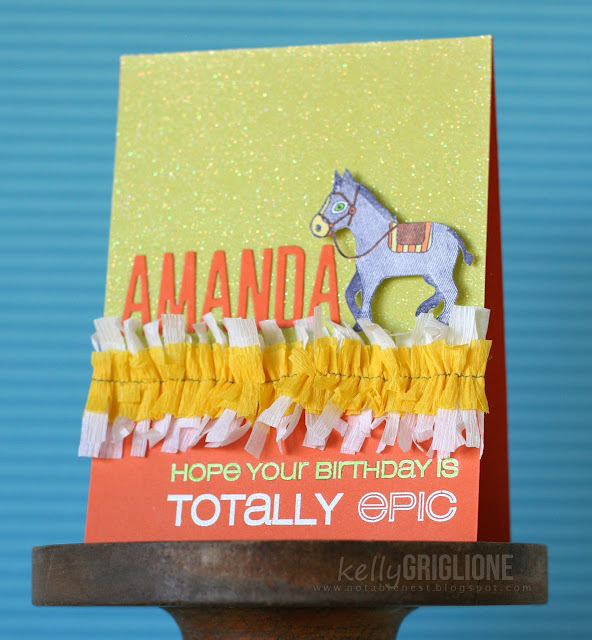 Happy Birthday to my AWESOME bloggy friend, Ardyth Percy-Robb! 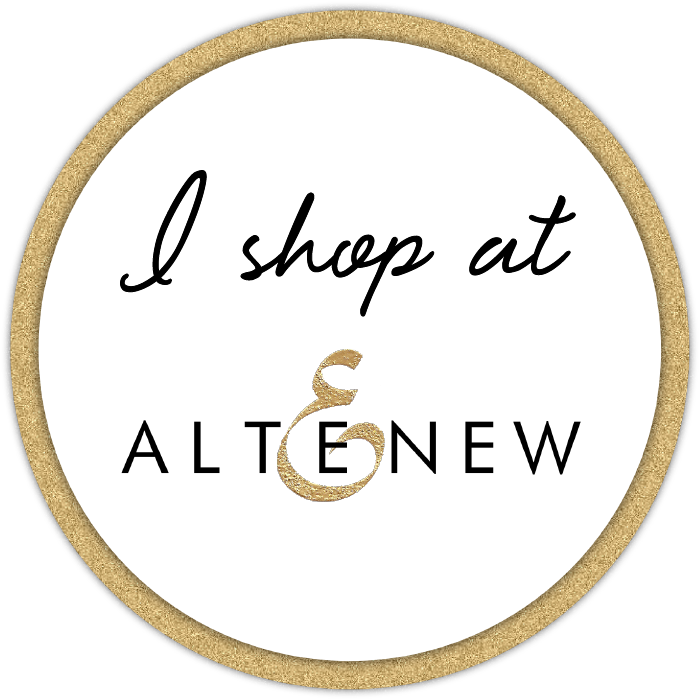 The details: as some of you may know, another FABULOUS bloggy friend Darnell Knauss has organized a birthday surprise for Ardyth. Several people are posting cards made for Ardyth and linking back to Darnell's blog (what a lovely hostess!) If you would like to join in the fun, please do, and link your "Happy Birthday, Ardyth" card to Darnell's blog. OK, back to Birthday Business. Ardyth has such a distinct CAS style, you can spot one of her amazing cards a mile away in a gallery. Especially if it has horses or a piano on it! So naturally I wanted to make a card in her style, and I immediately knew which card I wanted to CASE. It's this lovely. And I'm so pleased that I was able to find it right away. I remembered it was a Thank You card, so clicked on her Thank You gallery and there it was. Couldn't be easier! And here's my CASE. Very similar ... except now looking at it again I realize that the base is a little different, with the circle floating on this one. Since it is Ardyth's birthday, I must send her good wishes, in addition to letting her know that she rocks. So I tilted the design from the front and added the sentiment down the middle. Oh, yeah, and SPARKLE! -Rats, missed this one. Anyway, please check back with Darnell's blog to see who else is wishing Ardyth a fantastic birthday, or to participate yourself. Ardyth, I hope you feel the love today and get some time to enjoy yourself! 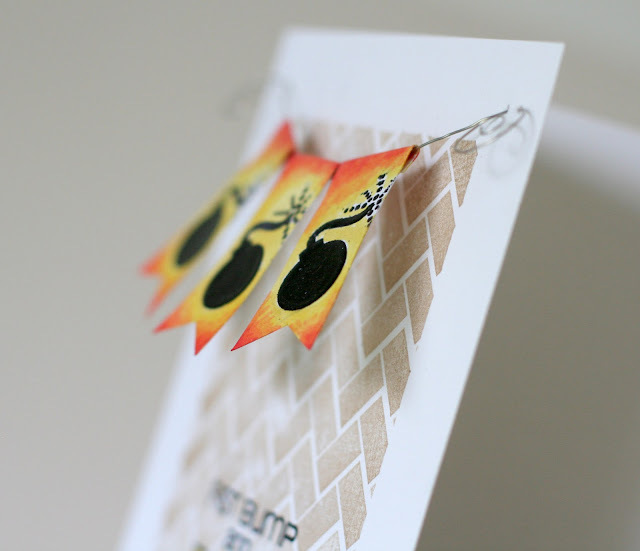 Hi all, it's my monthly post featuring cards with the amazing stamps at CASual Fridays Stamps! This one is the more traditional card. 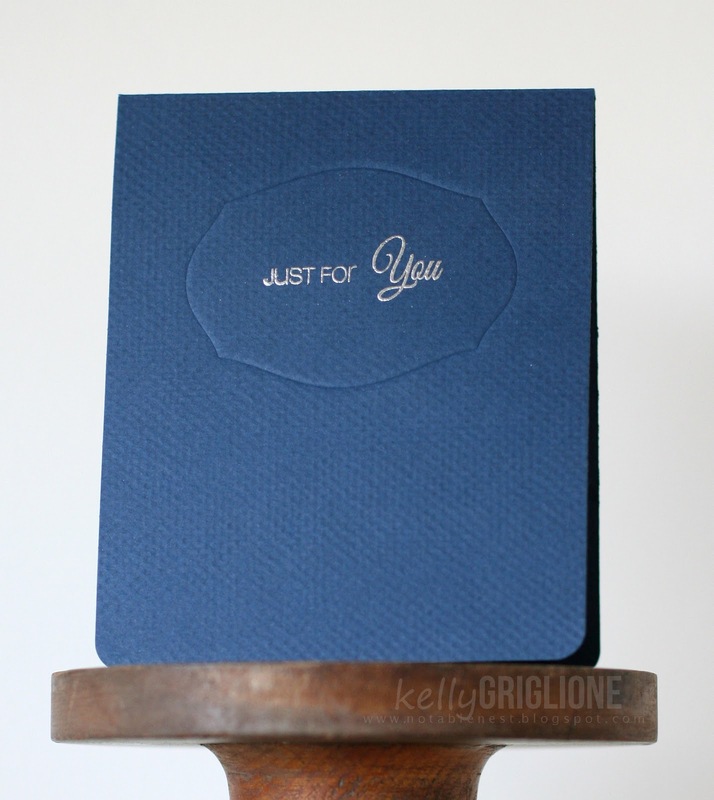 It uses the sentiments and flourish from Frankly, each embossed in a different color. I think that helps it balance my crazy retro bird! He's cut from a rather wild ribbon I got at a flea market from the 1970s. 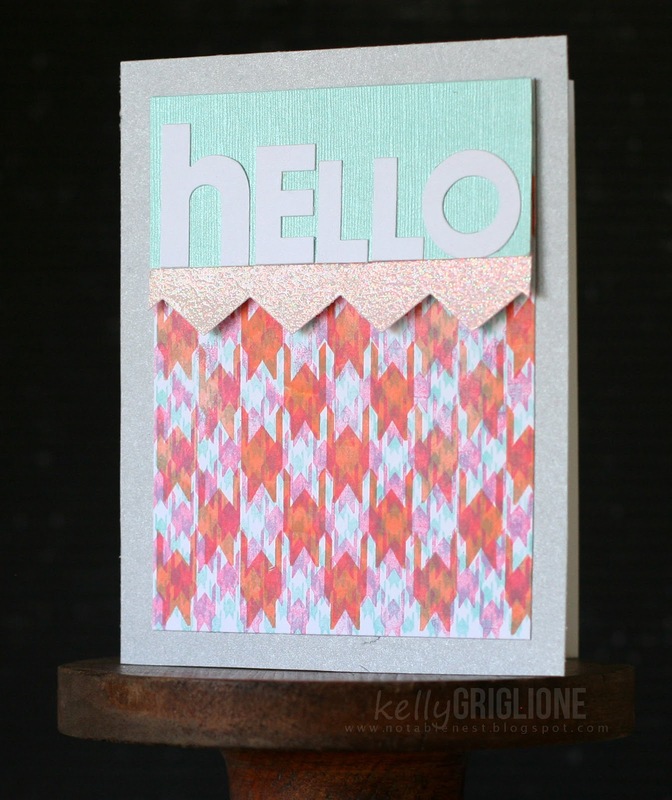 If you don't look at the colors, it would be right in style today with those chevrons! Everything comes back in various forms, right? I cut another bird from chipboard to give him some weight. The next card uses Houndstooth, but it's not traditional. 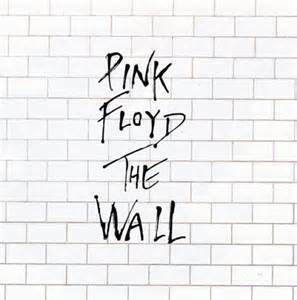 In fact, it's a little out there. 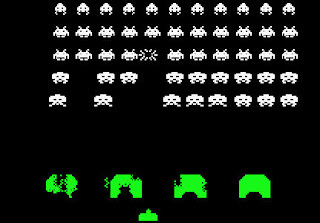 A classic video game that debuted in the late 1970's ... Space Invaders. Oh how many quarters I used in my quest to defeat those aliens! But what does this have to do with houndstooth?!? Right? Can you see it? Too much of a stretch? 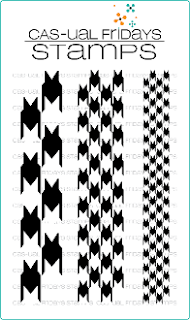 The large houndstooth totally reminded me of the aliens from Space Invaders. Stamping just one column of the border stamp gives you houndstooth in a row, like Space Invaders, instead of the typical staggered pattern. 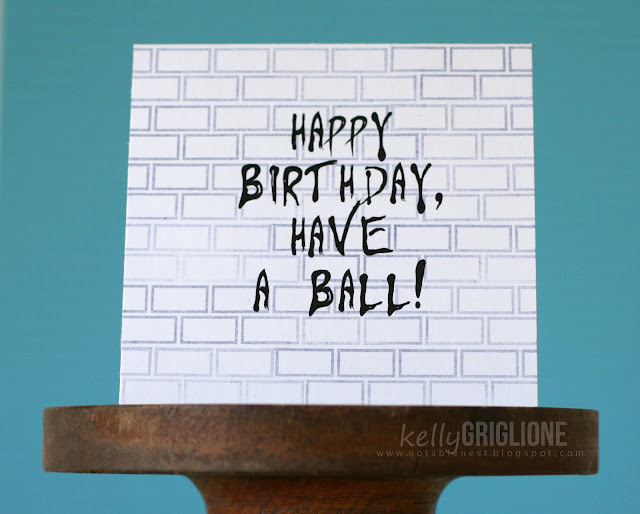 I thought this would make a great older male birthday card (not too many of those in my stash!) 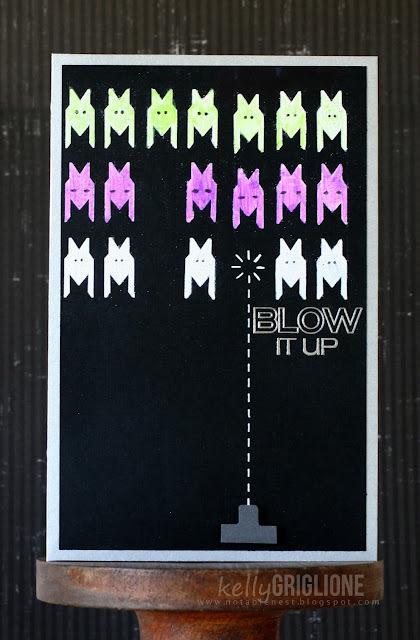 Excited to see that it went so well with the "Blow It Up!" sentiment from Ka-boom! The sketch challenge this week had me stumped a bit. I just really couldn't think of anything interesting to make. 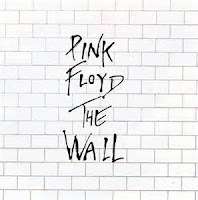 Then, at the 11th hour, I though of something, and scrambled to make it happen. So pleased with how it turned out. It's one of those cards where I go check on it before going to bed, just because I'm so excited. 1) Complete accident how the small flowers on the left and the big one on the right point to the clock focal point. 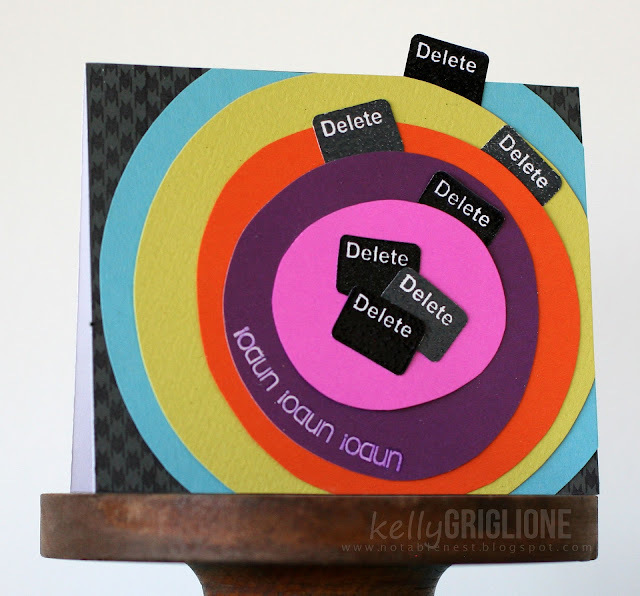 2) To get more of a bigger circle look, I tilted the glitter polka-dot paper after I cut my too-small circle. So, complete accident how the dots are on a diagonal instead of the straight way I'd normally use them. 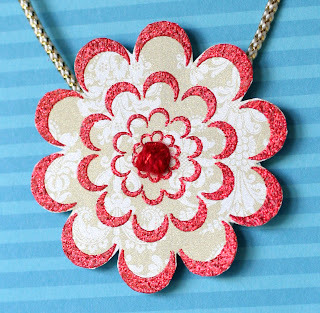 3) The polka-dot paper scrap fell over and I saw the beautiful raspberry color. Perfect for behind the trellis die. 4) I used some aqua washi tape (a solid one I never use on projects) to hold the super thin and flimsy dot stamp on the curve before I put my acrylic block on it. Loved the look of the aqua on the card. Never intended on using it. So I tried thinking of a way to incorporate the aqua. Banner, nah. Sentiment background, nope. Enamel dot ... YES! Where? The center of the clock with no hands! YAY!! My favorite part. 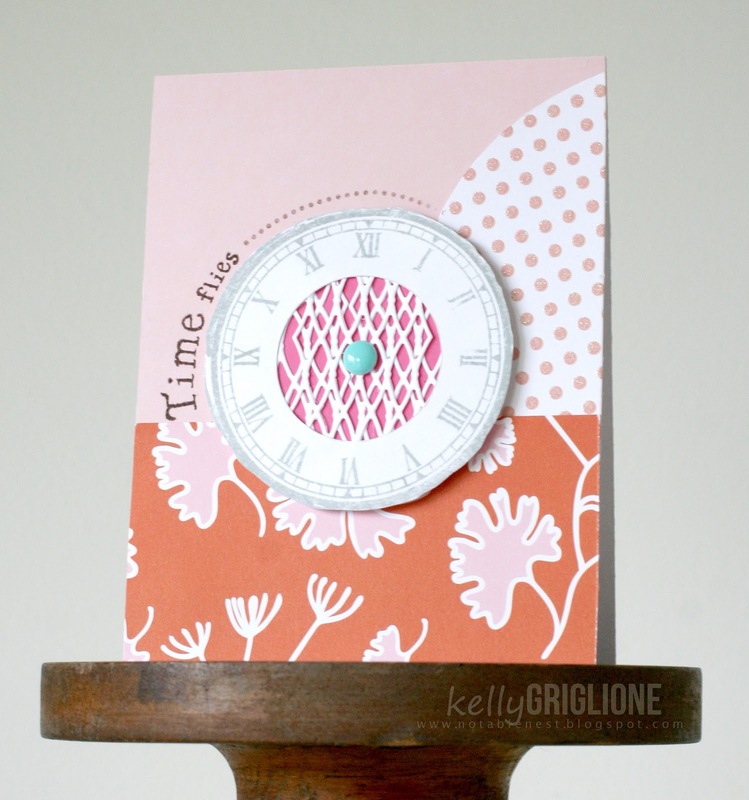 The center of the clock is made from layers of the Memory Box trellis die. It's actually only one length of the die, cut in thirds. I wouldn't have thought to cut the middle of the clock out and back it with a pattern were it not for the sketch detail. Sure hope to see more amazing cards this week in the gallery! Also check out the sketch, photo, and fusion inspired samples from the fab design team! This week our sponsor for the CAS-ual Fridays Challenge is Simon Says Stamp, where the winner will receive a $25 gift certificate. Whoo-hoo!! 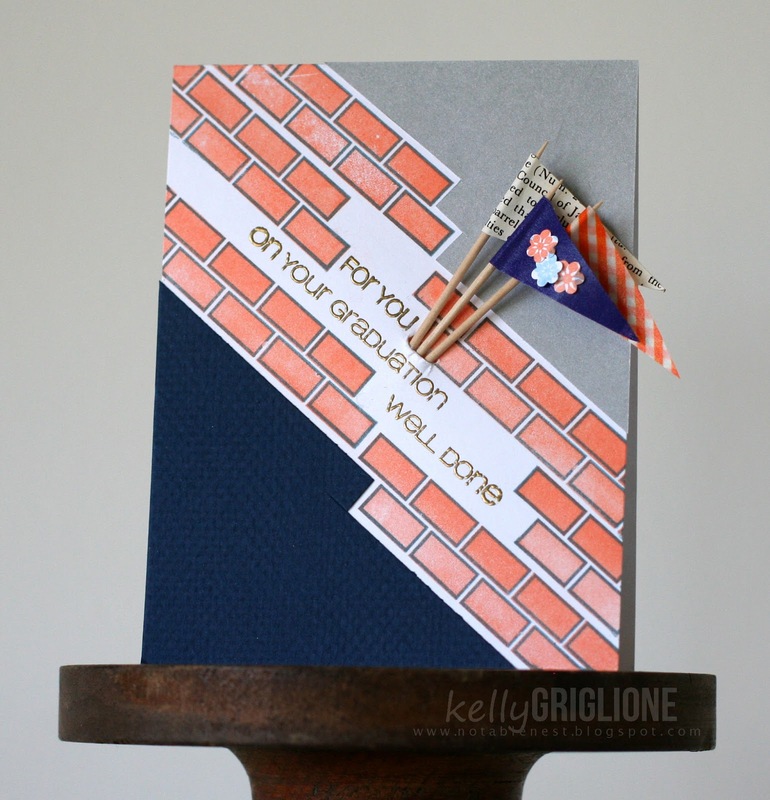 I am totally not being patriotic for this post [hangs head in shame] but I've honestly never sent a patriotic card. Maybe I should! But for now, my red white and blue creation is, instead, a message of hope and rebirth. A cardinal sitting on her nest, waiting for her chicks to hatch. The best is definitely just about to come! The bird is cut from my son's holey pajama top. On the non-holey part (yes, I save EVERY thing!) Her nest is made from a strand of wrapped burlap, which ended up being the most difficult part of this card. It's inspired from the Easter egg bird nests I made this year. The white branch divides the card base. 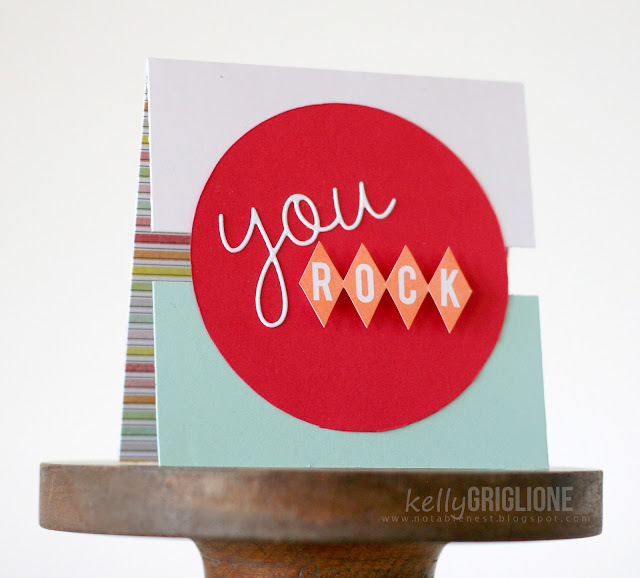 Finally, the sentiment is from CAS-ual Fridays Stamps' first card set, Truth Is. Sure hope to see you in the gallery! And don't forget to check out the other red, white, and blue lovelies from the fantastic design team, if you haven't already! Yet another FUSION winner from the last challenge (what a great card, you really have to check it out if you haven't already!) I have a feeling this week might provide a non-FUSION winner ... let's see! My challenge, as always, is based on the sketch only. This is a 10-year-old birthday card for our dear friend and neighbor who's in love with orange and glitter. Gathering crepe paper layers along a long running stitch makes the boarder. Then to break up the white embossed sentiment, the first row of text is colored with green alcohol markers. 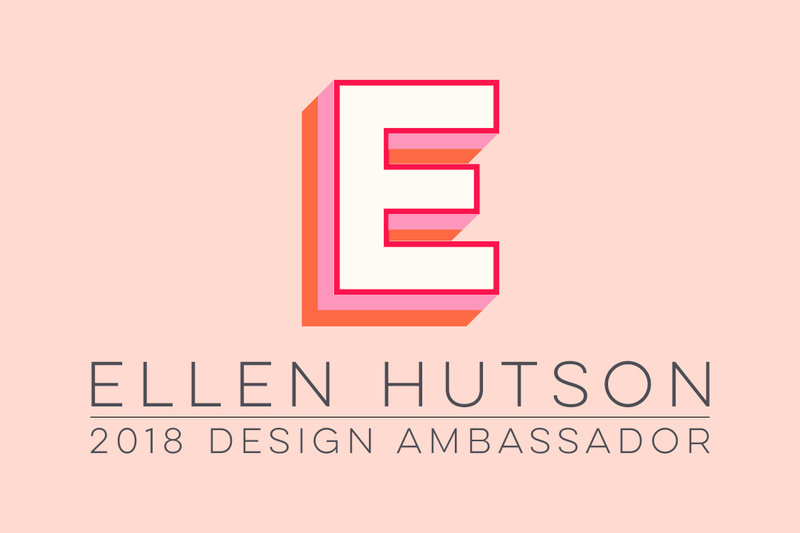 Head on over to the Fusion Challenge to check out the inspirational Design Team, and also the gallery, which I'm sure will be amazing. Wow, what a hoppin' 100th challenge party we had the last two weeks, with 227 entries! Some serious inspiration in the gallery, if you haven't gotten a chance to check it out yet. 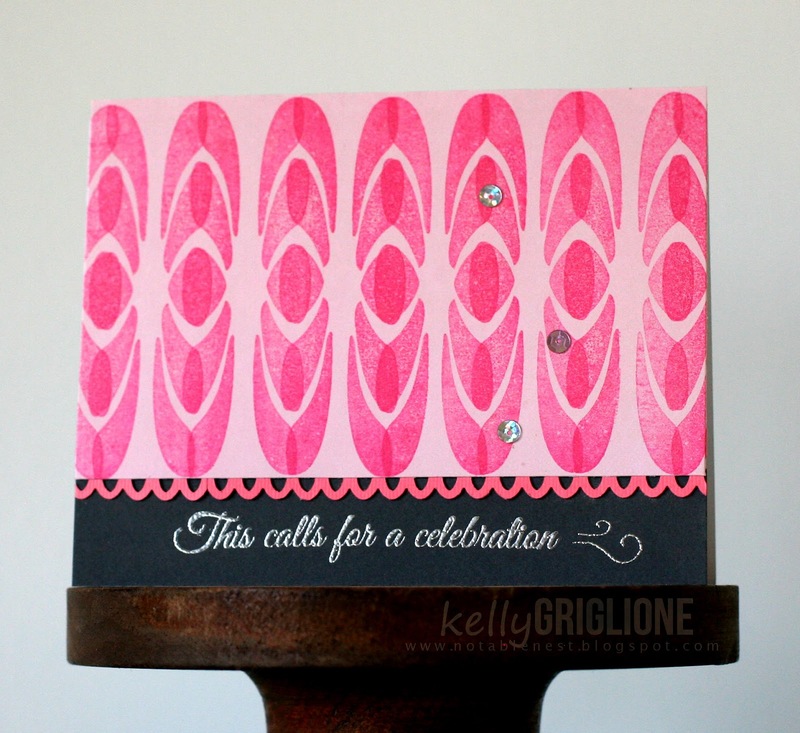 This week the challenge is to stamp on Designer Paper. I started out with the floral stamp from CAS-ual Fridays Loving Thoughts embossed in red glitter on a subtle, damask-like paper. At first I was going to thread this really funky red fiber through the centers of several of these and make a garland. I was annoyed getting them to hang evenly, so laid it down on the blue paper and it kind of looked like a funky necklace. A tweak here and there, and I ended up with a jewelry box card. Here's the front. The mat stack die is used as an impression on the top of the box. The sentiment is embossed in silver from Only You. Simple, just like a presentation jewelry box. Then upon opening the "box" you see the necklace on its lining. A hold punch is used to notch out holders on the top to dangle the necklace on. Since I wanted to get a ton of dimension for the box, I mounted the panel on two layers of cardboard. The spine is scored 1/8" thick, so it accommodates this dimension when folded shut. I was still a little unsure how to finish this card (just what is its purpose?) and was going to leave it blank for now. 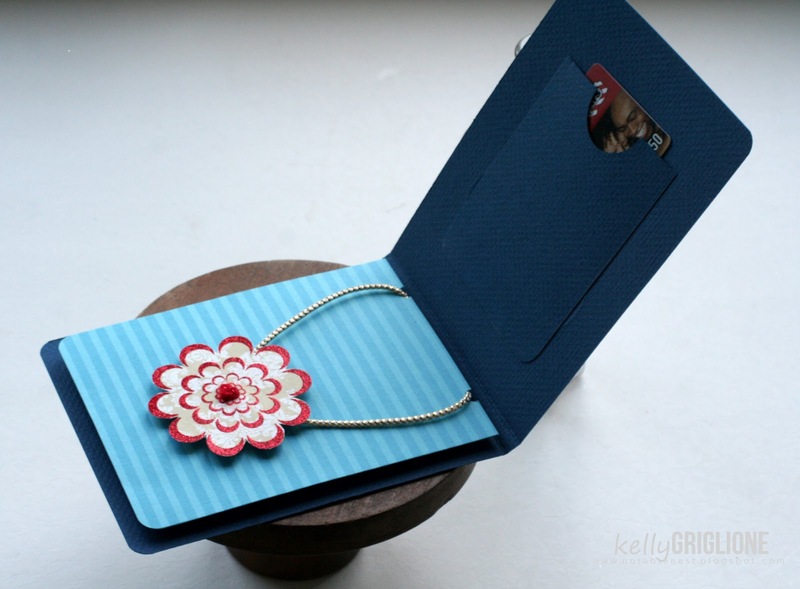 Then I came across the Moxie Fab gift card holder challenge. That's it! I cut out a panel to mount on the top-inside of the box for a gift card. Then got excited thinking how cute this would be for a teen girl birthday present! Stick a Charming Charlie's gift card inside, especially since this is the type of costume jewelry they sell, and you're all set. Don't forget to head on over to the CAS-ual Fridays Challenge to see the rest of the design team inspiration, and play along in the fun! I am so in love with all the sets from the May CAS-ual Fridays Stamps release, it's a little sad being the last sneak day. But on the other hand, I'm super anxious to share these cards!! Alright, we're using all of them. At once! 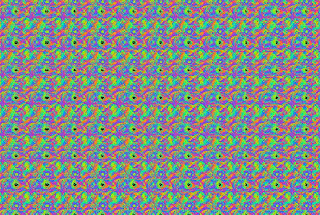 Anyone remember those Magic Eye posters that you stare at and a 3D image is supposed to pop out after several minutes? Those never worked for me (and, FYI, the link above is to an article that explains how to do it). Still can't see those darn 3D images! But I do like the idea of having a lot of patterns that make one big pattern. Back to the card above, do you see a yellow-outlined diamond pattern? Kinda cool! I had to try another version in different colors. Solid, orange diamonds stand out to me on this one. It's a border stamp, but you can certainly stamp it repeatedly as a background. I made a mask to sponge the pink on, and then freehanded the yellow above so there were no hard lines on top and it would blend out more. Sewing, silver embossing, enamel dots, and yes, a single quatrefoil from my bag of scraps round out the card. If you haven't already, head on over to CAS-ual Fridays Stamps to see what the other super-talented designers did with these sets. So much inspiration! And, check back on Friday for the full reveal of all five must-have sets! 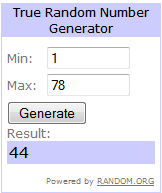 We have a winner of the free copy of 350 Cards and Gifts! Miriam, it's you!! Please send me your address and the lovely folks at Paper Crafts will be sending a copy right to you. Thanks so much to everyone for your incredibly kind comments. I've said this so many times, but it's so true, we have the best on-line community ever! Ahh, the power of these keys! Invaluable to us for blogging, now they can be on our cards too! These are from the Tech Talk set to be released on Friday at CAS-ual Fridays Stamps. This one is a little out there ... but it looks exactly how I felt a couple months ago when I completely stuck my foot in my mouth when chatting with friends. My head started spinning as I replayed exactly what just happened (the hand cut circles), and my head was screaming "Delete! Delete! Delete, delete, delete!!!!" The keys are embossed and fussy-cut. So many fun uses for these! Hopefully it's not a card I'll need again, but if I do at least I'll be ready so I can give it in a timely manner. I never seem to find the words in person, but giving an "I'm Sorry" card is so much easier. Be sure to stop by tomorrow for the debut of two more sets. On Friday each set will be revealed and available on CAS-ual Fridays Stamps. ETA: Thanks to Ardyth for reminding me that this fits the Tuesday Trigger! Hope you get a chance to play too, so many possibilities with this one! Yesterday I confessed my love for the Frankly CAS-ual Fridays Stamps set. Today, I'm going to make another confession, this time about Brickworks. Complete and total love affair (sorry, Frank). Here's a card with a traditional, filled-brick stamping, although the brickwork is interrupted to make room for the gold sentiment. 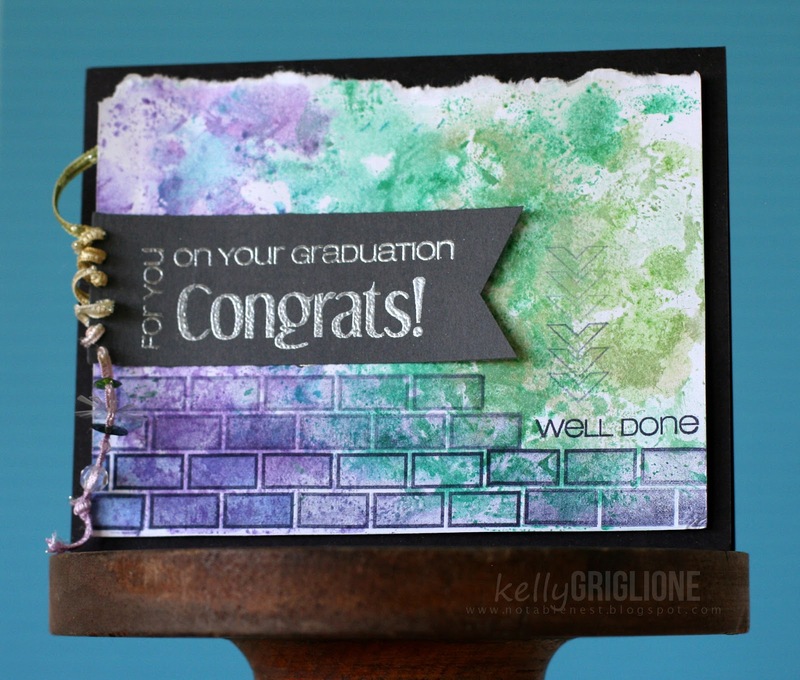 The school colors on this graduation card are repeated in the collegiate banners (tiny flowers from Bold Wishes). Finally, here's another Graduation card. The watercolor splotches are less structured, in contrast to the tidy bricks. 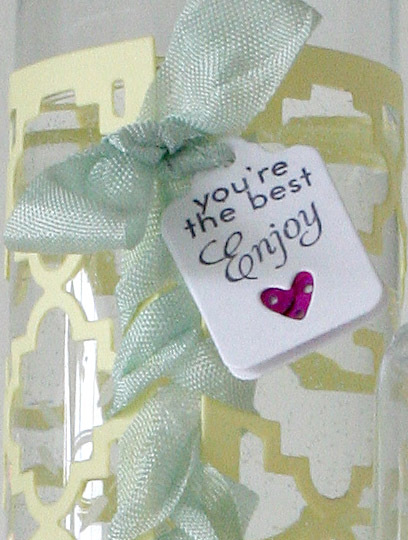 The sentiments on the banner and on the card are separated for more flexibility in your stamping. I threaded ribbon loosely through holes on the end of the banner. There are sequins here, but I resisted putting them directly on the card base. Instead, they are threaded on the end of the ribbon along with a crystal bead. Really have just scratched the surface with this set. Stay tuned for two more posts before the final reveal at CAS-ual Fridays Stamps on Friday! YAY, it's release week for CAS-ual Fridays Stamps! And this month there are not three, not four, but FIVE fabulous new sets released! I am seriously in love with them. Here are some cards from Frankly. This set has a great flourish stamp that can be used on its own, or stamped in a pattern. Here's what the stamp looks like on its own. 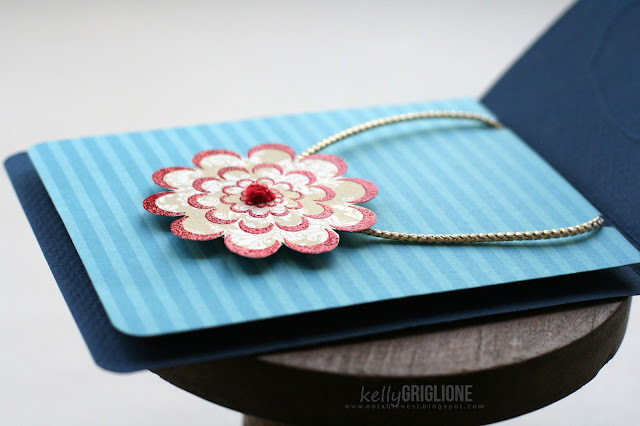 The rest of the cards feature this flourish stamped in a pattern. Here's another version. This time the double-stamped flourish is also rotated to create a one-layer flower. Two colors are used on this one. You know I'm a sucker for details ... I love how the center of the flower is the perfect size to emphasize the word "thank" in the sentiment. More angles. I'm loving angles. One more card. I couldn't put this stamp down! This time I stamped a bunch of the flourishes facing each other in a row (which actually inspired the second card in pink), cut them out, and made them into a 3D flower. The gold sentiment is another secondary sentiment. There are just so many great sentiments in this set. I'll be back Tuesday, Wednesday and Thursday with more sneaks. The final reveal on the CAS-ual Fridays Stamps blog will be on Friday! For the fourth Fusion Challenge in a row, we had a winner who was inspired by a fusion of the sketch and the photo. Not completely a surprise, since a very large majority of the gallery used both the sketch and photo as well. What will it be this week?! My card, as always, is based on the sketch. A banner woven through something. What should the something be? 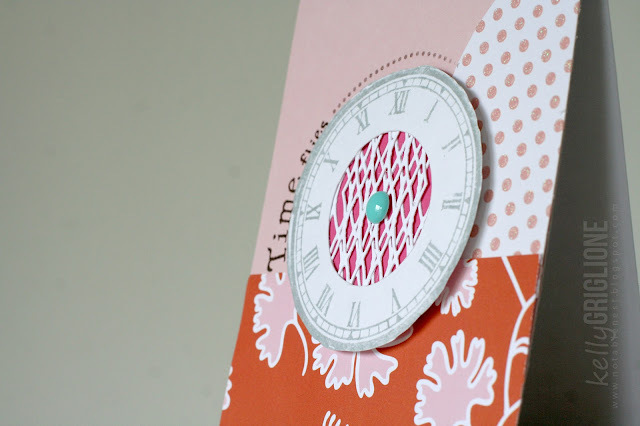 I've got a piece of quatrefoil on my desk from the Paper Crafts Blog Hop. Let's use that! 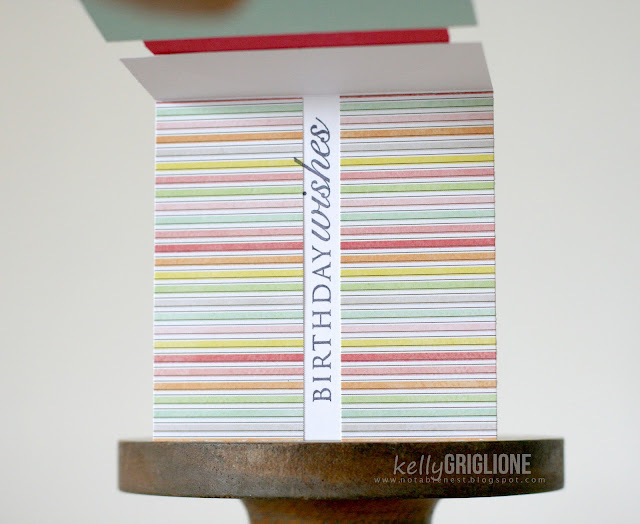 350 Cards & Gifts Blog Hop! 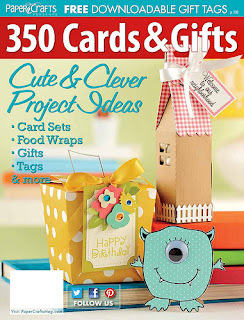 I am so excited to participate in the Paper Crafts Blog Hop celebrating the newest special issue, 350 Cards & Gifts! 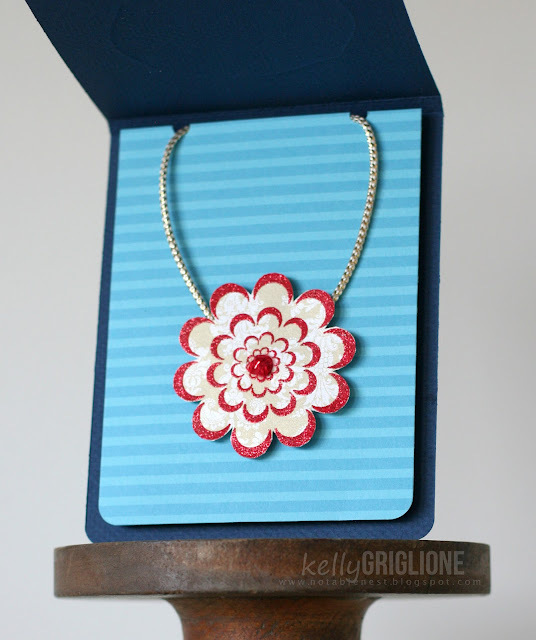 AND, I'm happy to offer a giveaway for this issue, compliments of Paper Crafts. Just leave a comment on this post by Tuesday the 14th for a chance to win (each stop in the hop will be giving away a copy, so be sure to visit them all)! This issue is jam-packed with ideas for gift-giving using the crafty supplies we already own. 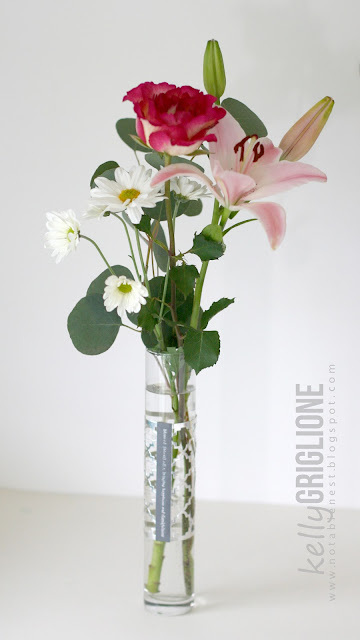 Today I'm featuring a gift that I've just finished giving ... upcycled Dollar Store vases! Perfect to accompany a birthday card/gift certificate combo when you want to do a little something special. And they all use the same die in different ways. 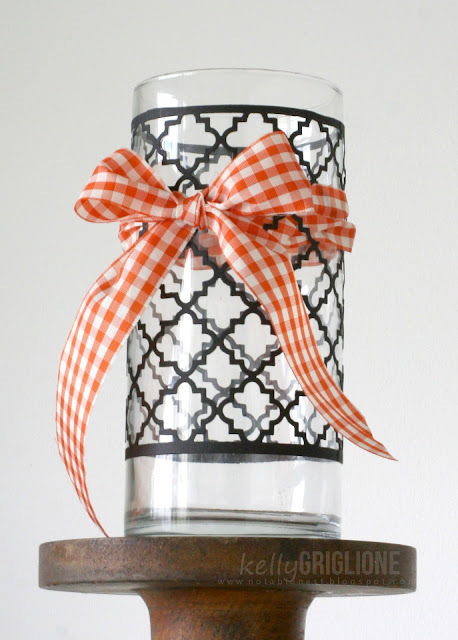 If you're new to my blog, you can catch up on all my quatrefoil die projects with the gallery link on the side bar. It started with this one, which uses 4 of the quatrefoil cover plate dies. I cut the long sides off, lined up the ends and carefully glued them together. You can see the seam in this shot ... look directly under the knot of the bow and you'll see the column of quatrefoils is elongated on the left side. 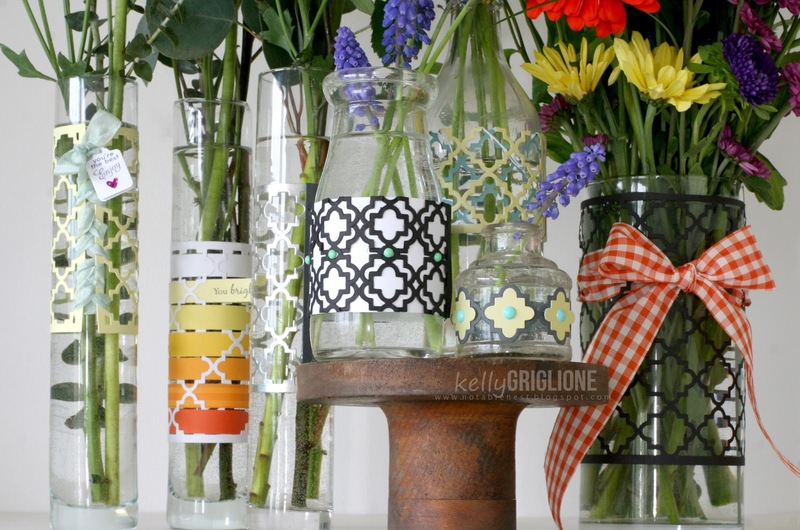 Depending on the size of the vase you're using you may have to do some creative cutting to make it work. A vintage ribbon from the 1970s is woven through the quatrefoils. Let's try some more! 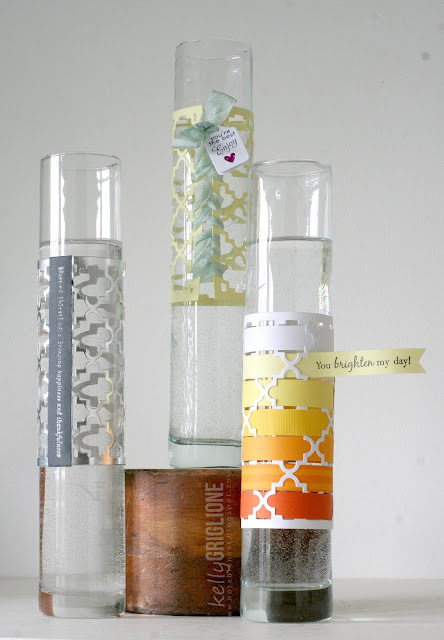 These are all skinny dollar store vases. They work well for single, long-stemed blooms. Bonus that they only require ONE cut of the quatrefoil die, so it's easy to make multiples. It's a little short when wrapped around though, so you need to address the seam. 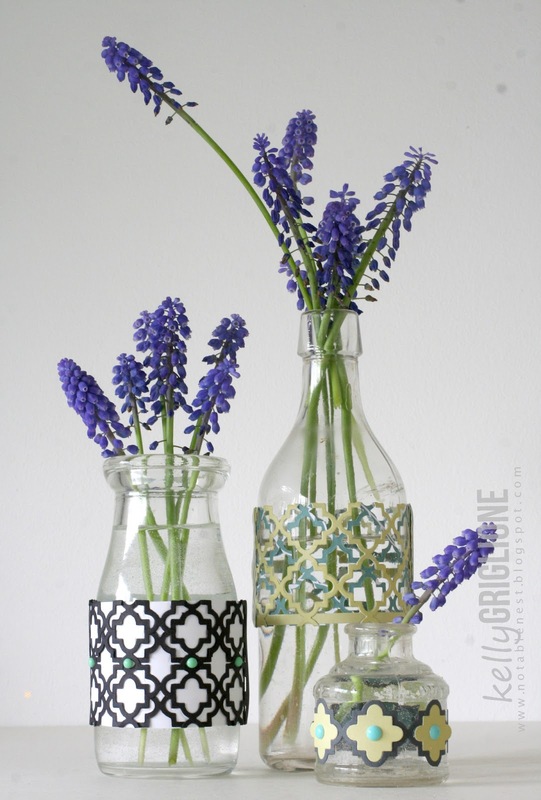 The vase on the left has silver foil paper with a strip of gray paper covering up the seam. 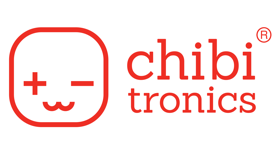 Turn this into a feature by embossing a sentiment on that strip. The seam on the middle vase is treated like a corset ... lace seam binding tape through the holes on each end and finish with a bow. 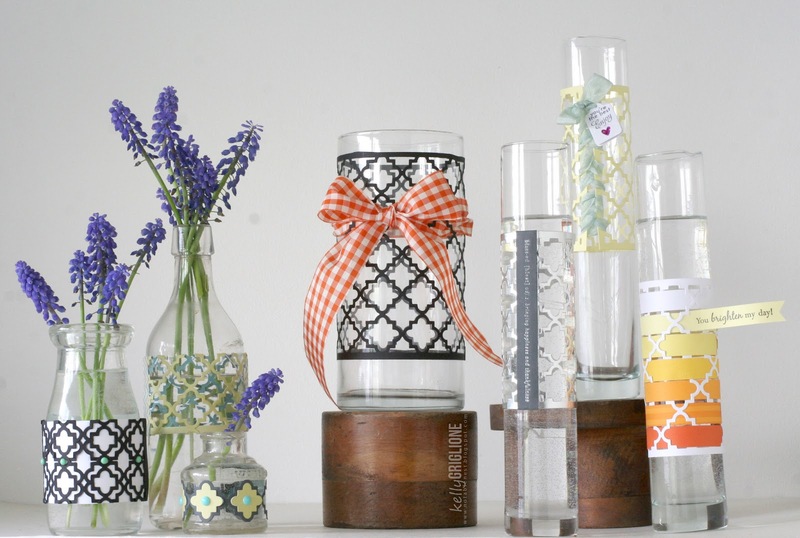 The vase on the right has strips of 1/2" paper woven through the quatrefoil holes and joined in the back. The ends of the strips are strategically hidden under the die. One strip extends out with the sentiment. Here's a close-up of the middle vase with the seam binding laced through the quatrefoil ends to hold it together. The sentiment is on a tag. Sequins peek through the negative heart. The vase on the left uses 2 dies folded in half to get a more intricate pattern. It stands out even more when backed with white paper. 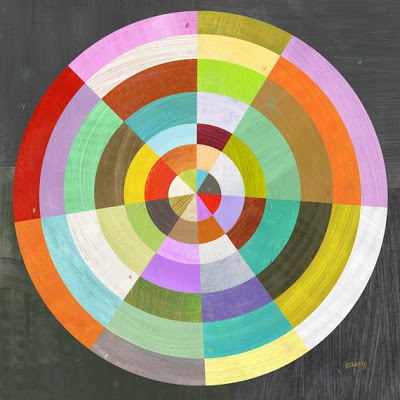 Enamel dots are in the pattern's center holes. The middle vase uses double-sided paper folded in half to get a two-toned effect. One of the solid edges is left on the bottom. The left vase (an antique ink well) showcases a single row of quatrefoils with the centers put back in. An enamel dot in the center of each quatrefoil gives a nice dimension. The purple arrangements on the left cost me nothing since the vases came from my house (milk bottle, soda bottle, antique ink well) and the grape hyacinths from my garden. The tall, narrow vases in the middle cost $3 each (I split a bunch of flowers in three, plus $1 for each vase). 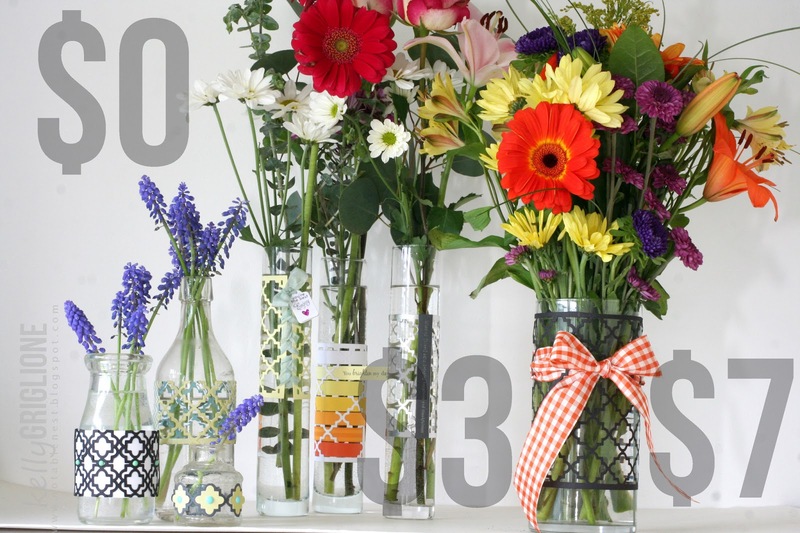 And the vase on the right only cost $7 for the entire bunch of flowers plus the vase. Aside from birthdays, what an affordable way to give a flower arrangement to a teacher, Mom, a grad (think school colors), or your incredibly kind neighbors! Here's a close-up of one of the $3 vases I gave to my neighbor who always stops by with delicious food to share. I don't spend much time cooking to reciprocate, but I do spend time crafting! Thanks so much for stopping by! Please continue on the hop to see what these incredibly talented ladies have made for you. You are going to LOVE Nina Yang's 3D present-topper at the next stop. And don't forget to comment at each blog for a chance to win your own copy of 350 Cards & Gifts! PS. 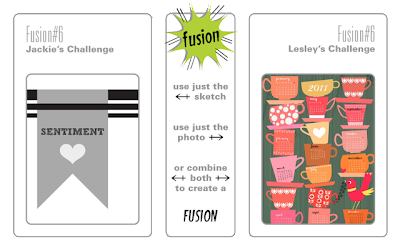 I hope you can play along with the Moxie Fab 350 Cards & Gifts week challenges! 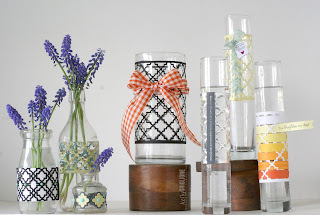 I'm linking these vases to the gift challenge.